The creation of your wedding stationery begins with a complimentary consultation (phone, video call, or e-mail). The goal of the consultation is to learn about your overall vision and the dreams you have about your wedding invitations. The more details you provide, the better! Photos of your dress, colors, flowers, cake, and venue are a great inspiration. 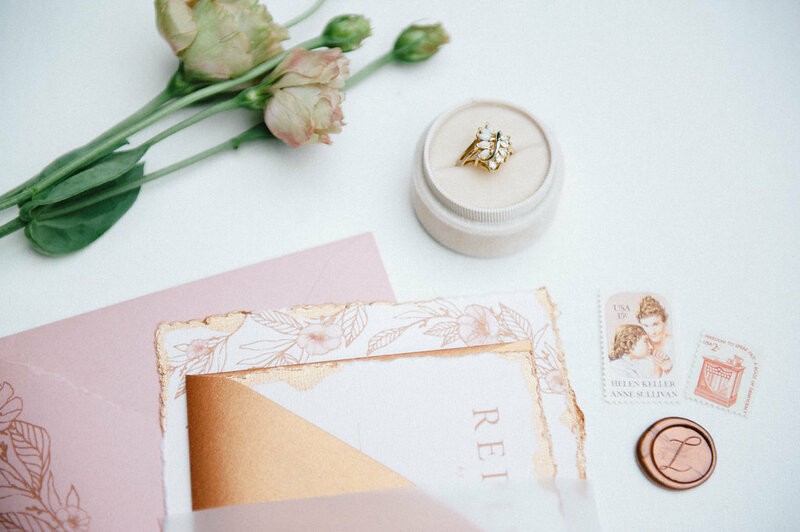 You can also provide photos of invitation styles you like but this is not necessary. We will discuss all of the items you're interested in and determine what best fits your budget and mailing timeline. Quantities are helpful but do not need to be set in stone at this point! Next starts the proofing process, I send digital proofs back and forth while we work on changes. This is the time to make design, wording, and color edits. There is no limit on the number of proofs, we will work on the design until it is perfect! Upon approval of the digital proof, a physical proof is printed and shipped to you. This is the time to confirm all of the ink colors and papers are correct. The physical proof will be identical to your completed order. Following the consultation, you will receive an official quote and a production schedule with deadlines for the whole process so we stay on track to meet your mailing date. A signed contract and deposit are required to begin the design process. This is a great time to ask any questions about wedding etiquette or how to word your invitation. Final approval of the physical proof must be sent via email. No changes are able to be made after this time. The remaining balance is due at this time and must be paid in full before the completed order ships. Some couples choose to assemble (address, stuff, stamp, seal, and mail) with family or friends but I do offer complete assembly/mailing services as well for an additional fee. My wedding is in January! My wedding is in February! My wedding is in March! My wedding is in April! My wedding is in May! My wedding is in June! My wedding is in July! My wedding is in August! My wedding is in September! My wedding is in October! My wedding is in November! My wedding is in December!